United States President, Donald Trump, has suffered a major blow in his resolve to destroy the Affordable Care Act, known as Obamacare, as the House of Representatives shelved a vote scheduled for Friday. Reports has it that the Republican dominated lower house shelved the vote because the party couldn’t find the votes needed to send it on to the Senate. They were planning to replace the AHCA with President Donald Trump’s American Health Care Act. “We came up short,” House Speaker Paul Ryan said at a news conference after the vote was cancelled. Earlier, Ryan visited Trump at the White House to assess the situation and the president told him to pull the proposal. 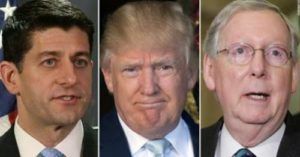 Several Republicans have said the president is finished negotiating on the matter and might now just leave the ACA on the books as the healthcare law of the land. Trump, Ryan and other GOP leaders must now decide what to do about former President Barack Obama’s signature law, which the party has pledged to repeal since the day it was enacted seven years ago. READ ALSO >> IS TRUTH DEAD?